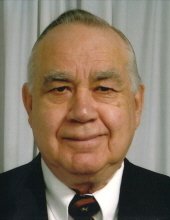 Cecil Spiceland, age 90, of Reidland, KY passed at 8:20 a.m. Tuesday, March 5, 2019 at the Calvert City Convalescent Center. Cecil was a native of Calloway County and was a member of the Benton Church of Christ. After attending college and obtaining a Master’s Degree, he taught at Brewers High School and was basketball coach at Sharpe High School. Cecil worked at Barnes Lumber Company for many years where he was in sales and the accountant, then later worked at Kitchen’s Inc. He enjoyed gardening, his charolais and angus cattle. Survivors include three sons, Joe Spiceland of Paducah, KY, Greg Spiceland of Mayfield, KY and Gary Spiceland wife Suzanne of Paducah, KY; one grandson, Christopher Spiceland and wife, Meagan of Nashville, TN; one great- grand daughter, Emma Claire Spiceland; one brother, Bobby Spiceland and wife, Rose of Murray KY; several nieces and nephews. Preceding in death was his wife, JoAnne Spiceland; parents, Fonnie Spiceland & Sallie Herndon Spiceland; three sisters, Lorence, Anna Mae and Jane; two brothers, F. H. & Sam Spiceland. Services will be held Friday, March 8, 2019 at 11:00 a.m. at the Milner & Orr Funeral Home of Paducah with John Dale officiating. Burial will follow at Woodlawn Memorial Gardens. Visitation will be held Thursday, March 7, 2019 from 5:00-8:00 p.m. at the funeral home. Expressions of sympathy may be made to Benton Church of Christ, 3091 Main Street, Benton, KY 42025 or New Pathways for Children, PO Box 10, Melber, KY 42069-0010.